OpenID software creator Janrain is launching a new iPhone SDK today, called Janrain Engage, which allows an app developer’s visitors to sign-in to the app with their existing accounts on Facebook, Google, Twitter, Yahoo, LinkedIn or other networks and then publish their comments, purchases, reviews or other activities from the app to multiple social networks. The social networking product, which is available through an SDK, allows developers to choose from a list of up to 12 login providers and specify the order in which they appear via the Janrain Engage dashboard. Janrain Engage will also remembers an app user’s preferred network on return visits and will provide a single-click return experience. 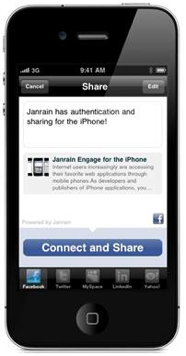 And Janrain Engage allows a developer’s iPhone application to authenticate users through iPhone’s native UI. For app developers, the benefits of integrating a comprehensive social network login product helps create between 6 to 25 new referral visits for each social action a user shares with friends. Janrain also offers an OpenID iPhone technology, which launched earlier this year. The company raised $3.25 million in Series A funding last year.